(TibetanReview.net, Aug07, 2016) – Chinese authorities were reported to have banned villagers in a Tibetan county in Sichuan Province from holding their annual festival of religious activities from the beginning of August culminating in horseracing and other events after they refused to carry out orders to fly Chinese national flags. 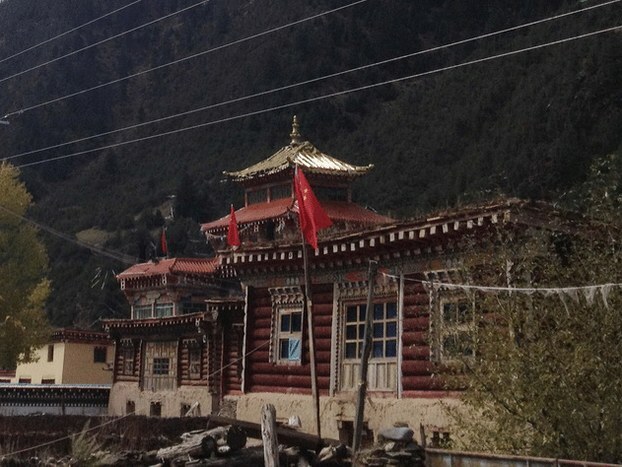 The flags were required to be flown over Dargye Monastery and the homes of the Tibetans in the surrounding villages in Karze (Chinese: Ganzi or Garze) County of Karze Prefecture, reported the Tibetan Service of Radio Free Asia (Washington) Aug 5. The annual festival begins with Sangsol, involving the burning of juniper leaves amid chanting of prayers and holding of rituals to propitiate mountain deities for ensuring timely rainfall and a good harvest. The horseracing event was to follow the religious activities. Both the monastic and lay communities were reported to have refused to accept the Chinese government order, saying this had never been part of the tradition. The authorities responded by banning the festival itself, which included the Sangsol and other religious activities as well as the following horseracing, snowlion dance, Tibetan opera performances and so on. The Tibetans were said to have already spent a good deal of money to prepare for the festival.